Many feiseanna offer competitions for adult Irish dancers. Here's a quick glance at feiseanna that are friendly to adult Irish dancers in January. Plan on supporting a feis in your area that includes adult Irish dancers and keep an eye out for those feiseanna who are offering slow speed dances for adults. Welcome to Andria Beauvais from Celtic Steps in Colorado. Thank you for taking the time to do an interview for our adult Irish dancers. Who began dancing first, your daughter or yourself? My daughter actually started dancing first. We happened to go to the Colorado Springs St. Patricks day parade and saw Irish dancers there and, well, it all began that day. I actually got started after my daughter had been dancing for a while. Honestly, watching her I thought this isn't that hard, I can do this. Not too long after taking classes I actually did my first feis and have been going strong since then. As an adult do you feel encouraged and supported at Celtic Steps? I actually get a lot of support at Celtic steps. About 5 years ago I dropped down to the age groups and had to dance with the kids. The Celtic steps family is very supportive of everyone. Even when you think you can't do it, there is some who will always say you can do it. Most of the time they are right but there are somethings that my body just won't do. You own Sheehan’s Irish Shop. What inspired you to open an online dance store? I opened the Irish dance store so that there was something local here in Colorado Springs so people could get shoes and supplies faster than driving 45 mins to an hour to the shops in Denver. What are your short and long term personal goals for Irish dancing? Right now I'm not sure what my goals are for Irish dance are. I've been dancing for several years, first as an adult and then in the age groups. My main goal in Irish dance after I dropped down to the age groups was to make it to championship and I have reached that goal. Will you be competing in slow speeds this coming year? I've been dancing slow speeds for several years. 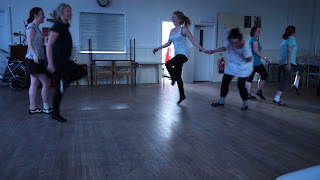 I do help with colorado springs Celtic steps adult class and I have been working with them on their slow steps and they are actually very excited about doing the slow steps. What do you think the future looks like for adult Irish dancers? Things have changed so much for the adult dancers over the past few year and I really hope that it continues for them. I hope that maybe some day they will bring championships back for the adults. As long as there is an interest, I think the adults will continue to keep dancing and enjoying it. What music do you practice your Irish to? I personally love the Top Box cd (Dean Crouch) and Kin'sha cd. I love anything that is more up beat and fun to dance to. Thank you Andria. Congratulations on reaching your goal of Championship level and good luck in your future dancing. The Irish dance club at Villanova University in Pennsylvania provides opportunities for all college students of all levels. There are classes for the greenest beginner, and a course of study for those who desire to continue competing while in their collegiate years. 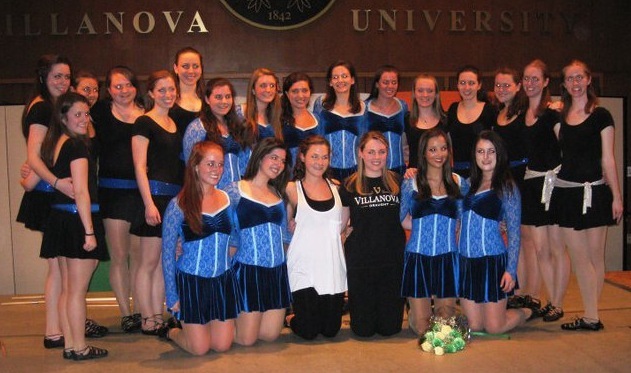 In 2006 a group of dedicated dancers wanted to share their love of Irish dance, music and culture with the Villanova community. 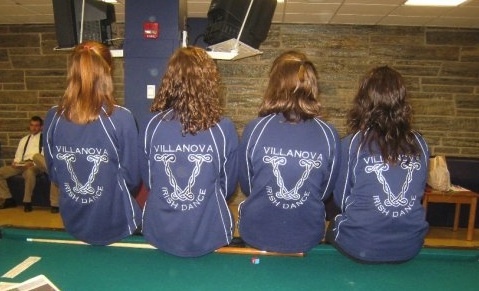 The Villanova Irish dance club was formed. All dances are choreographed by students and include traditional sets and ceilis and contemporary figures and solos. Co-captain Kristen Boersig has been told that there's a different sort of energy that sets them apart from other dancers on campus. "We like to mix traditional and modern moves to upbeat and recognizable songs," Boersig says. 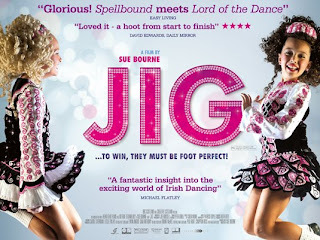 "That way the audience can make a connection and relate to the performances, even if they don’t understand the background of Irish dance. The Irish dance team performs all year on the Villanova campus and in local areas around Villanova. With St. Patrick’s Day comes an annual showcase as a way to celebrate the dances they have learned. Classes are available for beginner, intermediate and advanced classes. Beginner adult Irish dancers get the opportunity to show their new dancing talents at many of the performances, including the St. Patrick’s Day Showcase. Intermediate adult Irish dancers can learn more advanced technique in soft and hard shoes. Advanced adult Irish dancers meet often for team and solo work, competing in regional, national and international competitions. For more information about the Villanova Irish dance club, take a look at their website. 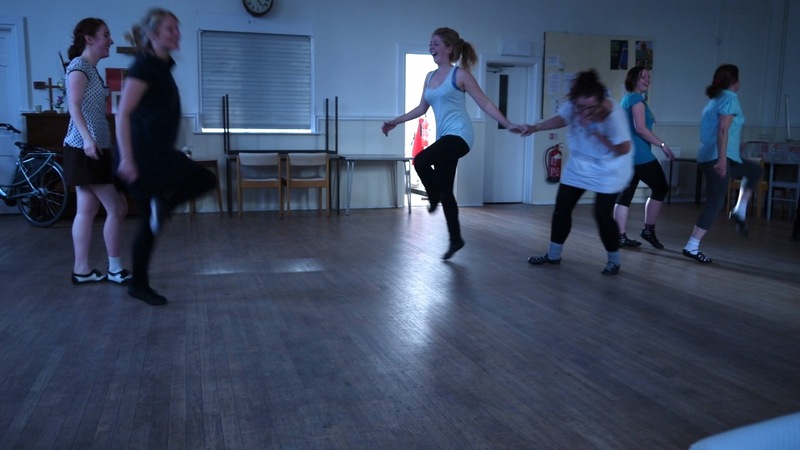 Adult Irish dancers from Hopping Mad Scoil Rince na hÉireannin Brighton, UK practice for a feis. Many feiseanna offer competitions for adult Irish dancers. Here's a quick glance at the adult-friendly feiseanna in November. Plan on supporting a feis in your area that includes adult Irish dancers. At Saint Mary’s University of Minnesota, students have an opportunity to pursue Irish dancing in their college education. The Irish dance program, headed by Kathleen M. Flanagan, Ph. 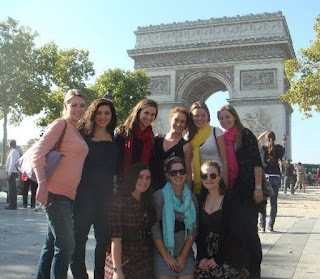 D., is part of the dance minor offered in the school’s theater and dance department. 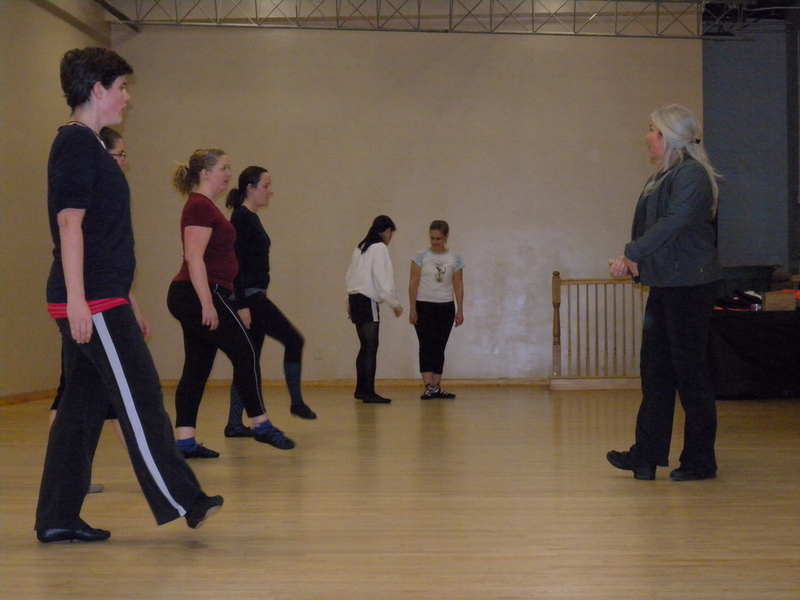 Any student can take individual classes, or pursue career in Irish dancing. Originally from the Chicago area, Flanagan took dance from legendary teacher Pat Roche and obtained her T.C.R.G in 1976. When she moved to Minnesota she decided to continue teaching in order to foster an appreciation for Irish dance and culture. “I always say that I have been doing ‘evangelization work’ in southern Minnesota," Flanagan says. Students who wish to continue their Irish dance education can find what they are looking for at Saint Mary’s University. The dance department offers 3 ceili classes, two courses on Irish dance pedagogy, and classes on traditional and contemporary sets and music. Students are encouraged to take other courses offered in the dance minor, including dance history, composition, anatomy & kinesiology, and nutrition. The Irish dance program at Saint Mary’s University of Minnesota gives dancers a chance to continue their Irish dance education. Students who complete the program will be fully prepared to take the Irish dance teacher examination (T.C.R.G. exam). For more information, go to Saint Mary’s University of Minnesota's website. IrishCentral: Foot care tips and tricks keep Irish dancers on their toes. To dancers, feet are like a prized car that must be cared for, protected and maintained to keep their usefulness and get them where they want to go. For adult Irish dancers whose feet have pounded the ground more than the younger set, foot care is critical. Take the time to prevent foot problems and learn how to care for such setbacks as blisters, and ingrown toenails. 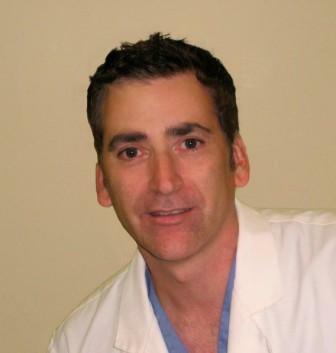 Most foot skin problems can be avoided simply by correct shoe sizing. 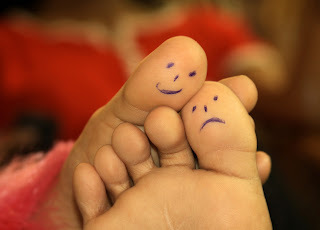 Too loose and your skin will slip and rub against the shoe, too tight and you may cause bunions and other bone problems. For Irish dancers that means making sure that both hard shoes and ghillies or reel shoes are snug but not pinching. Many adult Irish dancers have told me that they couldn't dance without their favorite foot care products. Below are some suggestions for happy, healthy dancing feet. Toe Tape help protect Irish dance feet. Bandaids and medical tape can be used on parts of the foot that get a lot of friction. Wrap the affected area before problems start and the tape or bandaid will take the abuse--not your skin. Anti-Chafing creams and sticks help lubricate areas that are prone to blister. One such product is a FootGlide Foot formula made by BodyGlide. One dancer claims that deodorant works just as well, but I have never tried it. Let me know if this has worked for you. 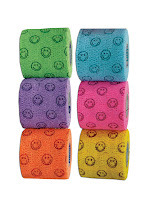 Toe Tape is another product that prevents blisters and chaffing. 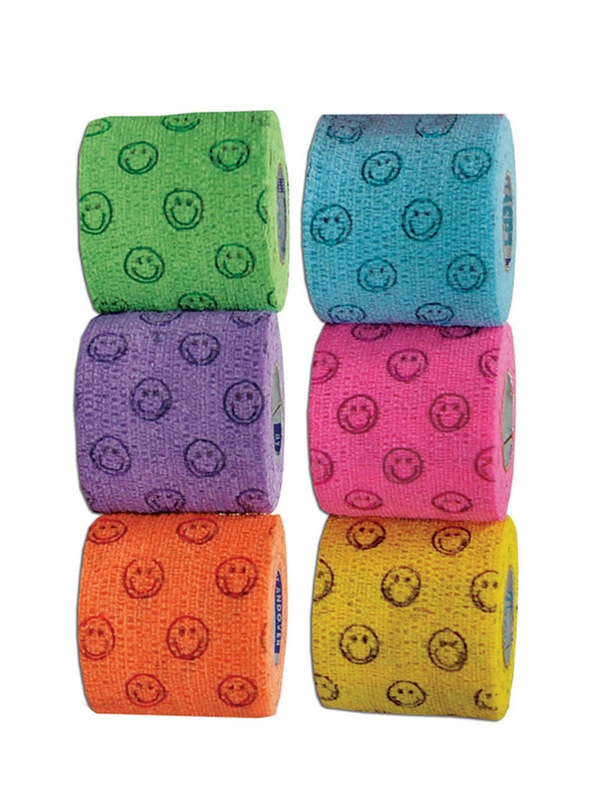 Check out these cute Smiley Toes Tape. Moleskin is helpful for sore spots and blisters that have already formed. Simply cut the moleskin to fit and cover the sensitive spot and keep dancing. Polymer toe caps like Bunheads Pinky Pads cover and protect sore toes (and fingers too). Cushions for the feet come in a wide variety and help protect the sensitive bottom of the foot. Dr. Jill's has a Gel cushion that sticks to and helps pad the ball of your foot. Toe separaters are placed between the toes to prevent and care for painful bunions, corns and ingrown toenails. When shoes are new they can cause painful rubbing on the ankles, especially those stiff hard shoes. Blister booties are worn around the ankle and foot, providing protection and relief. What are your favorite products and foot care tips that keep you dancing and give you the most mileage out of your feet? 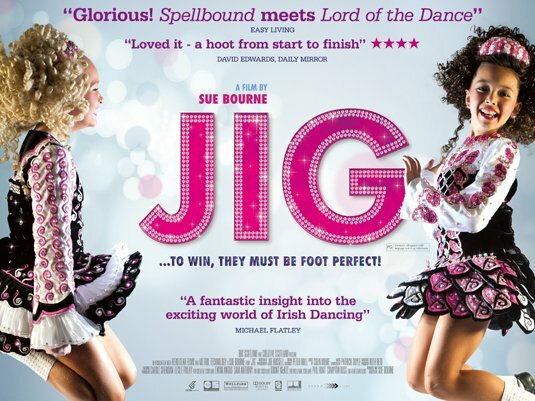 Last week I received my copy of Jig, the Irish dance documentary about the 40th World Irish Dance Championships. I put it on in my van as I drove a group of Irish dancers to dance lessons about 40 minutes away. I never knew that a documentary could be so captivating, but you should have seen the looks on the kids' faces. They were glued to the screen and let out small exclamations every few minutes as to the amazing dancers in the movie. One of the dancers featured in the movie used to spend 7 hours at a time practicing in his kitchen. My car full of dancers were awed by this. We talked about it for awhile and came up with the idea that if a dancer whose goal is to win Worlds practices 7 hours a day, couldn't a dancer with a smaller goal, say getting on the podium in prelims at a local feis would benefit from practicing even a half an hour per day? And that's what it takes isn't it? Especially when an event such as Oireachtas approaches, even a little bit of determination and practice goes a long way. What are your goals? Are you setting benchmarks for yourself to acheive those goals? 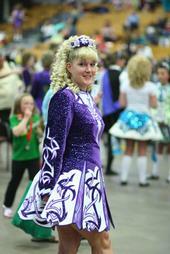 Today I am pleased to introduce Kim Carney, an adult Irish dancer who began dancing at age 22. Kim danced at the World Irish Dance Championships 2010 in Glasgow, and 2011 Dublin, and qualified for Belfast 2012. Before retiring, Kim placed 22nd at Nationals this year, qualifying for Worlds 2012. Kim dances with Anne Murray MacRitchie at Murray Irish Dance Academy. Kim talks today about what inspired her to begin Irish dance as an adult, what influenced her decision to retire and gives advice to other adult Irish dancers. When did you first start Irish dancing? I started dancing at 22 years old. I had always wanted to try it. However it was an expensive hobby and I was one of five children so I was unable to participate as a child. thought it would be fun to try. What inspired you to begin Irish dancing as an adult? I have been told that you qualified and attended Worlds as an adult dancer. What qualities do you have that gave you the extra push to get so far? as a nurse full time and going to graduate school. Dance served as my stress relief and was the best part of that busy time. I also wanted to push myself as far as I could. No one else was making me dance, it was my choice. And my responsibility. If Anne was going to take the time to teach me, I was going to take that seriously. I am very proud of myself but I owe alot of my success to my teacher Anne, and our workshop teachers, all who worked with me regardless of my age. What did you learn about yourself when you competed at Worlds? That hard work really does pay off. My second worlds, 2011, though I did not recall, I did get a rank, 63rd, and was in the top half of my competition. I poured myself into my dancing. Between strengthening, practicing, and classes I was putting around 20 hours a week in. My hard work really paid off. I also learned that the only people who had to be okay with my competing were Anne and I. There were a few times were I was looked down upon for competing at local feis and the Oireachtas (message board posts, and heard through the grapevine of people griping). People felt I was too old. They probably did not realize I had started so late, though that should not really matter. Anyone who wants to put the work in and compete should be allowed to. What influenced your decision to retire after qualifying a third time for Worlds? I rounded off my Irish dance career at Nationals this year by placing 22nd and qualifying for Worlds2012. It was unbelievable. I had hoped, but never expected to qualify for worlds at nationals. I retired about a month ago after nationals, just shy of 7 years of dancing. I have a new job as an RN at a Boston Pediatric Hospital and dancing will unfortunately not fit into my schedule anymore. I have decided that this is a good stopping point for me. I love to dance, but I at this point in my life other commitments (job, family) are taking over. Will you continue dancing as a teacher or a performer? I plan on remaining involved with Murray. I hope to help Anne out with school events, and with the younger dancers as my time allows. What advice do you have for other adult Irish dancers? If you want to take your dancing to the next level, do it, don't let fear or other's negative opinions stop you. If you are willing to put in the time and energy you can achieve so much. Find a teacher who is supportive and see what you are capable of. What do you envision for the future of adults in Irish dancing? I hope that the adult Irish Dancing field continues to grow. I was very happy to see a team of young adults in the film Jig. I was also very happy to see the number of senior ladies dancing at Nationals. The competition has required a split that last two years. Dancers are dancing longer, and starting later than ever before. Heritage Irish Stepdancer adults from Colorado practice an 8-hand. Many feiseanna offer competitions for adults. Here's a quick glance at the adult-friendly feiseanna in October. Plan on supporting a feis in your area that includes adult Irish dancers. Key: FF-first feis B-beginner, N-novice, PW-prize winner, O-open championship, / indicates combining of levels.